That’s what the ticket said for my surprise trip with Sapporo and Pack Up + Go. While I knew how to get around New Orleans, I was still excited to return to one of my favorite cities in the world. Sure, I’ve gone drinking on Bourbon Street, done Mardi Gras, and meandered through the Garden District. But what return trips do is let you go deeper and get beyond the surface. That's where the mystery lies. So often as travelers we pull up a sightseeing list from the web, ticking off "the ten best things to do on your first visit" as we walk around town. We rarely peel back the deeper layers of the onion and try to get to know a place on a local level. I was getting a chance to return to a city I know and love while still getting to unearth more about it, to peel back those layers and dig underneath the surface. I got the chance to return to my favorite po boy place. To gorge on oysters and seafood. 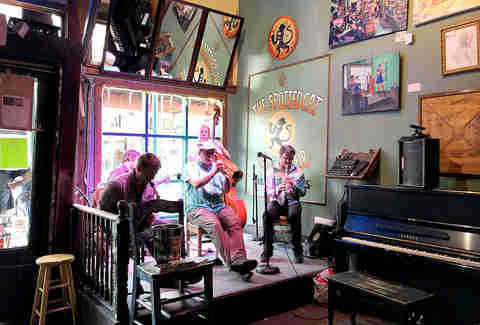 To meet some locals and rock out to jazz on Frenchman. There’s the world and then there’s New Orleans. This is a city where anything can happen, where the lazy humid days turn into a fast-paced blur of a night. You never know who you’ll meet and where you’ll go. So, once I landed, I was determined to laisser les bons temps rouler (let the good times roll). I only had 48 hours in town. But, in New Orleans, a lot can happen in two days. 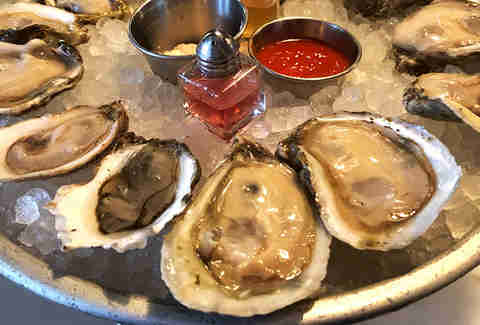 After dropping my bags at the Ace Hotel, I headed down the street to Seaworthy, an oyster place recommended by both Thrillist and just about everyone else I talked to before my trip. This is a small seafood restaurant with dim lighting, a few tables, and long bar where you can watch them shuck the oysters you're about to eat. They're famous for their delicious seafood and over a dozen kinds of oysters. Sucking down half-off happy-hour oysters while nibbling on popcorn shrimp was the perfect way to start my sojourn in the Big Easy. Getting there right when they opened had its perks: Other than a party gorging on shellfish towers in the corner, I had the place to myself. After filling up on seafood, I meandered toward the French Quarter. It didn’t matter that it was Wednesday. Every night on Bourbon Street -- so named for the Bourbon dynasty that ruled France when the colony was built -- is a party. The street is lined with bars trying to outdo each other for loudest in the city. But here, as the tourists shuffle between pubs and bands play for your dollars, you catch the carefree vibe that makes this place such a magnet for everyone. I wasn’t looking to join the revelry tonight - there was a lot to do tomorrow -- but, dipping in and out of a few bars, I sat there drinking a cold beer and watching everyone laughing, smiling, and slowly winding up for a big night. Everyone around me was just happy to be in the Big Easy and ready put away their inhibition for the next few days. As they carried on, I couldn’t help but enjoy my surroundings. Yes, it’s touristy. But there’s nothing like some time on Bourbon to remind that a visit to NOLA is a carefree one. Going deeper was the theme of my trip. I wanted to get off the beaten path and learn something new. 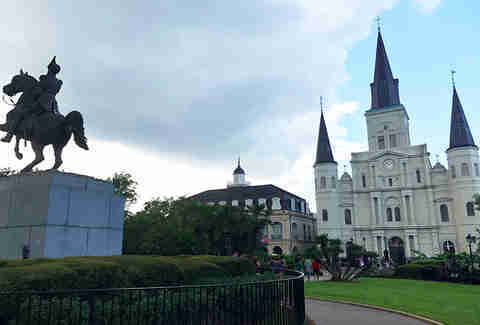 So the next morning, I joined the Free Tour by Foot walking tour to learn about the history of the French Quarter. I love walking tours. When you walk around a city on your own, you often don’t understand the context of what you’re seeing. You could stroll past some historic site but never know it. There aren’t always signs or a listing online. Anything you’re standing in front of could have an untold and maybe creepy history. As our guide Sarah, a lifelong local, talked about how the quarter’s name came to be (the French were the first to settle this district because it was the highest ground), how New Orleans passed through the hands of multiple nations (French, Spanish, French again, then, finally, the US), and how the architecture is more Spanish colonial than French, I realized that I didn’t know New Orleans as well as I thought. Everything I thought of as French influence was not that French after all. I walked away from the tour with a deeper understanding of the French Quarter, its history, and the people who lived there. Suddenly, the place began to click and an understanding formed: You can’t know a place unless you know its history and, for once, I felt like I knew both. From there, I wandered along the riverfront. But New Orleans in the summer is humid, so I retreated into Café du Monde. Among the chaos of thousands of tourists and servers bouncing between tightly packed tables, I ate what might be the world’s best beignets -- covering myself in powdered sugar in the process -- before retreating into a little upscale bar called Orleans Grapevine. In New Orleans, there’s always time to relax and slow down. The humidity forces everyone to move at a slow pace, and no one is in a rush. You shouldn’t be, either. Even with just 48 hours, you can find some time for R&R. Back at my hotel in the late afternoon, I took a dip in the pool. The Ace Hotel is modern, but still industrial with old-style furnishings. Let’s call it hipster 1930s art deco. Craving more culture, I dressed and headed to K-Paul's Louisiana Kitchen for traditional Creole food. This is one of the restaurants Sarah the guide pointed out and, though a total splurge (they have tablecloths and servers in formalwear), I couldn’t pass up the chance to eat at one of the best restaurants in the city. There, throwing back more soft shell crab, beans, and rice, I was in heaven. I must have passed this place a thousand times in my previous travels through the French Quarter but had never bothered to go in until now. Another new discovery and place to add to my must-eat list. Of course, I couldn’t leave New Orleans without listening to live music in the birthplace of jazz. And Frenchmen Street is where locals go to do that. From d.b.a. to the Blue Nile to the Spotted Cat (my personal favorite), you’ll find some amazing live jazz every night of the week. I jammed out to a band at the Spotted Cat, a small bar with wide-open spaces for dancing while chatting up some locals about travel and music. I used my last day to try Willa Jean, a popular southern comfort restaurant with a large open-air kitchen and dining room serving upscale food (It’s hugely popular with bachelorette parties). 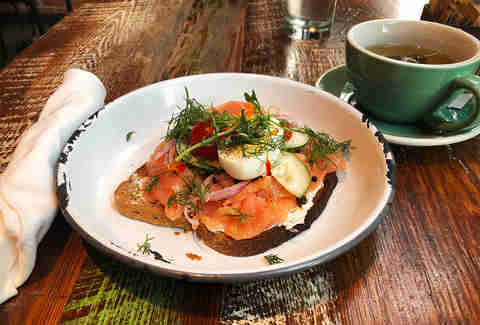 I ate some non-traditional food -- a salmon plate -- while chatting with the waitstaff about all the parties here. One thing I love about solo travel is that it forces you to talk to other people to stave off the dryness that comes with never opening your mouth. 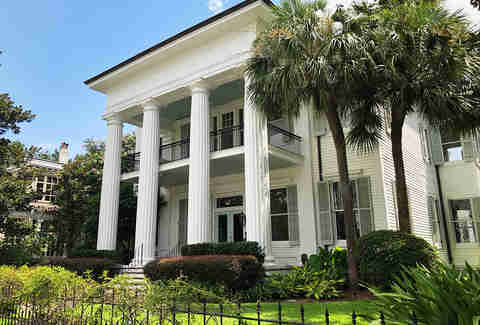 From there, it was off to my final stop, the Garden District, to browse my favorite bookstore, Garden District Bookstore. While I didn’t find anything to buy, I loved wandering their stacks and seeing what books were out. There’s something intensely pleasurable about wandering a bookstore filled with unknown authors hopping to find that one little gem that changes everything. 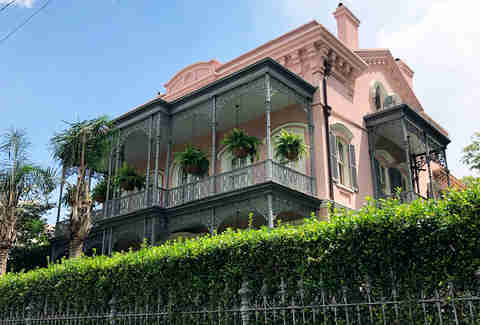 From there I went for a final stroll to marvel at the neighborhood’s opulent mansions, where, in the early 1800s, wealthy Americans moved when they didn’t want to live in the French-speaking French Quarter. As I boarded my flight back to New York, I was struck by how much I had done in 48 hours. 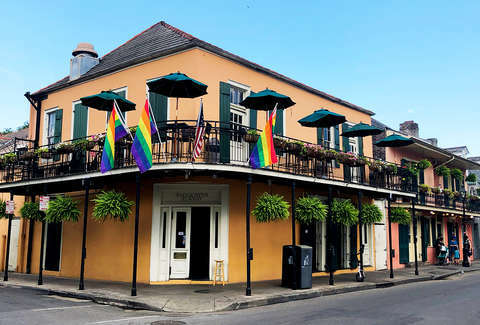 In New Orleans, it’s easy to stumble upon a great bar, café, or jazz club, or a delicious hole-in-the-wall restaurant. In fact, it’s almost impossible not to. Learning about the city’s history and culture on my walking tour, talking to locals at the Spotted Cat and other friendly venues, and just plain slowing down, allowed me to peel back the layers of the onion just a little bit more. The mystery of New Orleans got solved the best way it could: over food, drinks, and great music. This trip I went beyond the ordinary and scratched below the surface. Sure, it was only 48 hours, but this was exactly what I needed for the city to finally click with me. Laisser les bons temps rouler indeed. Envious of what you’ve seen? You could win your own trip by entering at Sapporobeer.com/explorebeyond. To find out where you can enjoy a Sapporo in New Orleans, or anywhere in the US, visit sapporobeer.com/find-sapporo. The views, opinions, and preferences expressed here are those of the Sapporo brand ambassadors and do not necessarily reflect those of Sapporo.